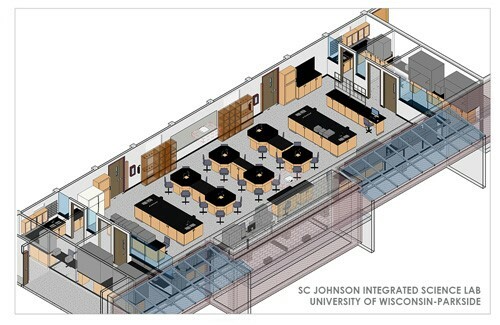 Parkside continues the tradition of excellence with the introduction of the SC Johnson Integrated Science Lab designed by Mayer Helminiak Architects. Students receive hands-on experience using state-of-the-art instruments in high impact practice lab exercises. The lab integrates students from multiple areas of study creating a collaborative and diverse learning environment. The instrumentation students will be using are the same found in industry leading workplaces. Apartment demand continues to grow according to this article in the Cedarburg News Graphic. "Every designer's little secret is that they copy other designers' work. They see work they like, and they imitate it. Rather cheekily, they call this inspiration." --Aaron Russell. Aaron Russell is an American Brand Specialist, Graphic Designer, Web Designer, Photographer, and Producer. Regents residence hall at Concordia University Wisconsin in Mequon. "Design is like a mom, nobody knows when she's around, but everybody misses her when she's not." --Santiago Borray. Santiago Borray is a graphic designer and brand specialist. TCC Building located in Pewaukee, Wisconsin. "Making good design is easy. It's polishing the half-assed stuff that takes time." --Stefan G. Bucher. Stefan G. Bucher is an American writer, graphic designer, and illustrator. He is the man behind the California design studio: 344 Design. Kapco Park located at Concordia University Wisconsin in Mequon.